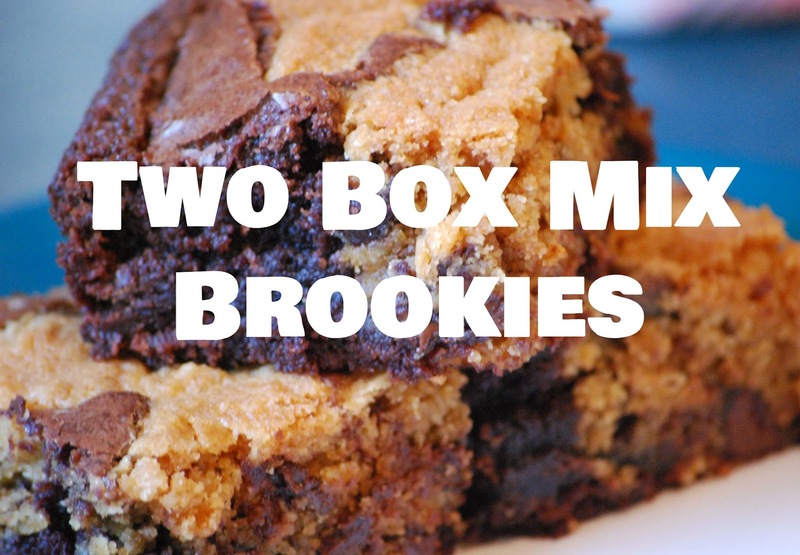 We have suggested making two box mix brookies for years now and why? Because they are so easy and so good! Everyone thinks they are made from scratch or store bought when they are really made from two box mixes. All you need is a package of Betty Crocker chocolate chip cookie mix (if they have two sizes for the cookie mix, make sure you get the larger of the two) and Betty Crocker fudge brownie mix. Prepare both mixes as instructed on the back of their packages. You'll need to grease a 9 x 13 pan and preheat your over to 350 degrees. Once your 9 x 13 pan has been greased, pour in the prepared brownie mix in the pan. Next, add your prepared chocolate chip cookie mix to the brownie batter. Simply add the cookie mix by the tablespoon fulls, randomly throughout the brownie batter. Bake at 350 degrees for about 45 minutes. You can use a toothpick to make sure they are done (to test, use a toothpick by poking one in the center of the brookies and if the toothpick comes out clean, the brookies are done baking). Wait for the brookies to cool, then cut and serve.